Of all the plumbing services we provide, slab leaks require particularly careful attention. Because of the complexity of slab leaks and slab leak repair, it’s important that you are aware of a few key aspects before addressing a solution. At the end of this CRC Plumbing tip, we hope you’ll have all the information necessary to detect these leaks, correctly locate them, understand why they are dangerous, and how you be responding to a leak in your home. A slab leak is a plumbing service term that describes a leak occurring in the water lines through your home, specifically the lines running below the concrete foundation (known as the slab). As naturally occurring movement happens below your home, the concrete foundation faces consistent strain that could eventually lead to a crack. Because your under-home plumbing is connected to the slab in places that movement may be occurring, pipes may also loosen or crack. What are the dangers of a Concrete Slab Leak? Structural Damage: Because these leaks lay below the home, the introduction of water, increased movement, and changes in pressure can cause long-term foundation damage. Health Issues: When water stands for a long time, it harbors dangerous bacteria and mold that could slowly infect your home. Other problems: Waterlogged carpets, ruined floors, and foul odors. How do I know if I have a Slab Leak and need Slab Leak Repair? 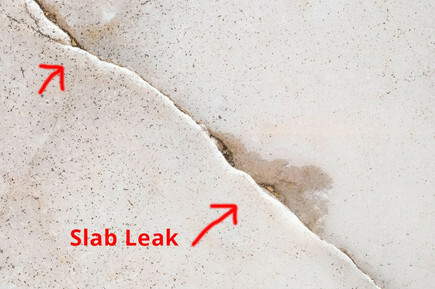 Though a slab leak can be detected a number of ways, the most common ways to identify a slab leak are feeling/seeing excess moisture in your home or having abnormally high water bills. If you notice these issues, that does not always mean you know where the leak originated from. Most home pipes are covered in protective sleeves that may be diverting water to a different location. For this reason, it’s important to find a reliable leak detection company to address the issue as soon as possible. If any repair attempts are made without properly identifying the origin of your leak, you may introduce new problems that are much more difficult to solve, like increased structural damage. How is a Slab Leak solved? When repairing a slab leak, it’s important to expect the unexpected. With so many variables involved, it’s impossible to predict how your specific leak will be resolved. Look for a skilled, trustworthy plumber that has experience in safe and efficient repair techniques. Though using a jack-hammer to uncover the piping is a common practice, it’s not always the best option. Some advanced techniques can allow a plumber access to the pipe without drastic foundation changes. In all cases, make sure the damaged pipe is brazed, not soft-soldered. This well help ensure a long-term solution. If digging your floor up is not an option, a pipe re-route is a good way to ensure the slab leak does not resurface in the future.